I was so happy, so humbled, so grateful! I was walking on cloud nine! Little did I know what was about to happen! pretty excited, the t-shirts I had ordered were HERE! They are so cute, I ordered three! to purchase iPads for Autistic Children. I support them in any way that I can. you know the stuff you do when you get home from work. On behalf of Cookies for iPads, here is an iPad for Collin! How can I say thank you for being a part of helping us reach 20 iPads, or all of the cookies you and your cookie friends sent? Well…by sending your amazing son the iPad he deserves! May God rich him greatly with this device in ways we can not yet see! In the box was an iPad for Collin! I grabbed the box, my phone and ran out to the back yard! A woman who was crying like a baby! And, I did not want Collin to see me! he was teary eyed too. Then I called my mom, and my sister, and emailed my bestie. I was just so humbled, and in total shock! no idea what so ever! "Yes, Collin, for you, because you are special!" I promise, he is excited......I just forgot to tell him to SMILE! He KNOWS cookies buy iPads for "special" children. Collin does not know HE is one of those special children. to get him a case for it. When we came home, he was watching TV, and the iPad was on the foot of his bed. When I asked him how he liked it, his answer shocked me. "Send it back, I do not deserve it, give it to someone who REALLY needs it"
and that they WANTED him to have it! "They gave me an iPad, because I am special"
with my cookie friends...they were all so nice...so supportive, so happy for Collin. I was so worried about sharing this with anyone. to GET an iPad for Collin. Would they think I had selfish motives in my support of them? Would they think Collin did not deserve it? 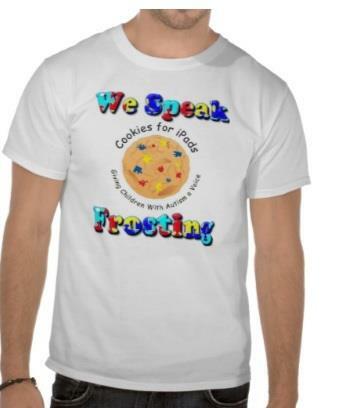 Cookies for iPads, and Autism in general? I will admit I was scared to share about it, publicly, for several days. Only our family and my close cookie friends, online knew about it. step out of my comfort zone, and share it with everyone. and on The Cookie Puzzle page. next, simply BLEW MY MIND! Oh Kim I am in tears reading this. Collin truly deserved the iPad. He is so special and so is his wonderful momma. I'm so glad you chose to write about this. Cookies for iPads is such a wonderful organization & I plan on helping them as many times as I can. What a special gift. Not just the iPad, but the fact that your son has a tangible item to remind him every single day that he is special. god Bless.